If you're looking for a great way to add a variety of lettering effects to your layouts, consider investing in a few sets of scrapbook stencils. Basically, stencils are templates that can be used to create uniform letters, symbols, shapes, or patterns. Sections of the template material are removed in the form of the desired design. When you trace around this negative space, you make a copy of the image. 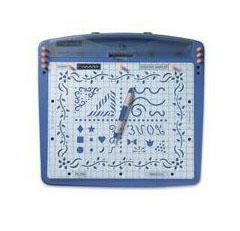 Stencils can be purchased wherever scrapbooking or craft supplies are sold. Stencils made from paper or thin cardboard are generally the least expensive, but thicker plastic stencils offer greater durability. Titles are an important part of any scrapbook layout, but it can sometimes be difficult to come up with unique ways to add lettering to your pages. However, there are many different ways to use stencils to design creative title treatments for your scrapbook album. If you're scrapbooking pages with heritage, baby, or wedding photos, embossing is a great technique to provide an elegant look. Try using the Fiskars ShapeBoss Embossing System to create raised lettering on cardstock, vellum, patterned paper, or thin craft metal. A clearview top stencil with positioning grid lets you view your work and perfectly realign the stencils when necessary. No lightbox is required, so the system is convenient to use and easy to store. If you love to use scrapbook chalk on your layouts, try using your chalk and stencils to create unique titles for your pages. Simply place the stencil on your paper and use a cotton swab to apply chalk within the open spaces. You can either use one solid color of chalk or combine several shades to create a rainbow effect. If you're worried about smudging the final design, use a spray fixative after your title is finished. Crafters who love scrapbook pages that are full of texture and dimension can use stencil paste to create a 3-D title. Stencil paste should be readily available at large craft stores such as Hobby Lobby and Michaels Crafts. However, you can also make your own stencil paste using common household materials. When using stencil paste, it's best to use plastic letter stencils with relatively large openings. You'll also want to wash your stencils immediately after use. Once hardened, the stencil paste will be almost impossible to remove. If have several extra shots of flowers, architecture, or other scenic elements from your most recent vacation, consider using your scrapbook stencils to create a photo mosaic title. Use a sharp craft knife and the stencil template to cut each photo into a different letter shape. Of course, this technique will also work with patterned paper scraps if you're not feeling brave enough to actually cut your precious photos. For a one-of-kind look, consider using actual paper stencils to design your own page embellishments. Use paint, glitter, beads, buttons, stickers, and other accents to decorate the individual letter stencils before adding them to your page. You can either spell out the entire title using letter stencils or add one large stencil letter to a handwritten tile to create a dramatic effect.